April is National Volunteer Month, when the work of volunteers is celebrated across the country. Neighborhood House enjoys the assistance of many volunteers to help us achieve our mission and to serve people in our community. One of the volunteer opportunities is in the Wellstone Center Food Market, where many volunteers come to help with our food program. 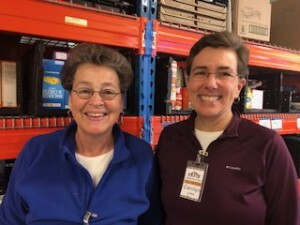 Neighborhood House Food Market volunteers Carolyn Jones and Mary Jane Ferber have deep roots/long lasting connections at Neighborhood House and volunteer weekly in the Food Market. Q: How did you hear about Neighborhood House? A: (Mary Jane) My family has deep roots on the West Side of St. Paul; I grew up in a house that was right near Humboldt High School. My parents were committed to Neighborhood House and volunteered here for years. I remember my dad delighting in being able to sit in his lawn chair and watching the Neighborhood House kids play sports across the street. Q: Were other family members involved with Neighborhood House? A: (Mary Jane) Yes! Me and several of my siblings volunteered and we also received the Constance Currie scholarship when we were growing up. Since my parents’ passing, my brother donated to Neighborhood House and now there’s a room in the Wellstone Center named the Marie and Bernard Ferber Room. Q: Tell me about your volunteer experience here. A: (Carolyn) We’ve been coming here together every Friday morning for at least a year to work in the Food Market. We wanted to keep the connection with Neighborhood House going and it’s been wonderful. I enjoy doing a little bit to help in the world. Q: What’s been the best part about working in the Food Market? A: (Carolyn) We help with whatever needs to be done (stocking, straightening shelves), but shopping with the participants is the best part for me. Even though there’s a language barrier sometimes, we still connect and I see their gratitude. Q: Is there anything that has surprised you? A: (Mary Jane) We also volunteer at the same time as a group from Koposia (an organization serving those with cognitive and developmental disabilities). I spent 30 years working as a special ed teacher in St. Paul, so I happen to know several of the volunteers from Koposia and get to work with them every week! Want to be a part of these connections? To see all of the volunteer opportunities at Neighborhood House, please visit www.neighb.org/support/volunteer or contact Vanessa atVedwards@neighb.org.